Hello we are Paul and Diane Malpass, a married couple with a grown up son and daughter. We established Ssaplam Therapies in 1999 after obtaining Diplomas in Holistic Therapy. Paul sustained a serious back injury in 1995 whilst working in industry. Following an emergency back operation, he was left unable to continue his career as an engineer, and was in effect told he would never work again. In his determination not to give in, he looked into the field of Holistic Complementary therapies and decided to re-train as a therapist. He qualified in 1997. As a result of the benefits he received from all the treatments he gave and received during the intensive training as a therapist he gradually became more mobile. Diane then re-trained as a therapist and qualified in 1999. 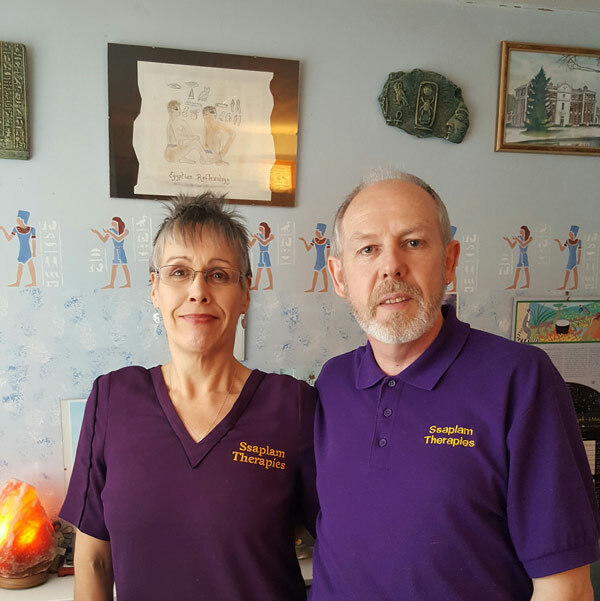 Our Diplomas encompassed Reflexology, Aromatherapy, Swedish Body Massage, First Aid, Anatomy & Physiology, Diet & Nutrition, Business Studies, Health & Safety and Counselling for Therapists. We later went on to take further courses in Indian Head Massage, under the expert tuition of Gloria Ferriday, of Foot, Soul & Bodyworks. Diane was attuned to Reiki level 1 in 1999. Paul obtained a diploma in Clinical Hypnotherapy in 2003. Diane commenced a Teacher Training Course in Dru Yoga in 2003 at the Life Foundation’s excellent retreat centre in Wales; due to personal circumstances she had to put the training on hold for some months, and re-joined the training course at the Midlands venue in Wolverhampton. She completed her training in 2008 and is now a fully qualified Dru Yoga Teacher and Member of the Dru Professional Network, currently holding classes on Tuesday evenings 7.30-9pm at Essington Wood Methodist Church Hall, Bursnips Road, Essington WV11 2RE. Please check out our Yoga section for further details. Some years ago we both found relief from various symptoms following consultation with an Allergy therapist. As a result of the dramatic changes in our health after following the suggestions made by that therapist, we decided to incorporate Allergy and Intolerance testing into the therapies offered by Ssaplam Therapies. We underwent training for Allergy & Food Intolerance Testing under the Med-Tronik’s Mora therapy system in 2005, with Stanley Richardson, who is Med-Tronik’s International Office representative in the UK. Then further training with Elizabeth Ann Hall early in 2006. In 2005 Diane sustained an injury which resulted in severe back pain. Following ten months of various procedures and treatments including physio therapy, acupuncture, x-rays, and a MRI scan, all of which gave little relief from her pain and discomfort, she met a Kinesiology Practitioner at a Health Fayre. Within ten minutes, following various muscle test techniques, she was told that the ‘back’ pain originated from a displaced TMJ (jaw). A small correction to the jaw was made and the back pain ceased. We were so impressed by the Kinesiology techniques that we underwent training in Kinesiology with the Northern School of Kinesiology. We then obtained Practitioners Certificates in Kinesiology in 2006, and Diane went on to obtain a further Certificate in Advanced Kinesiology. Owing to our own health issues we both turned for help to Complementary therapies. As we both found relief from various Holistic Complementary therapies, we would welcome the chance to help others in similar circumstances.